I tried reinstalling the latest version of Articulate and rebooting but this made no difference. If I take a PPT file with no Articulate functions added/avtivated, it will let me add a quiz from withing the Powerpoint file though - or at least it puts the placeholder slide there. 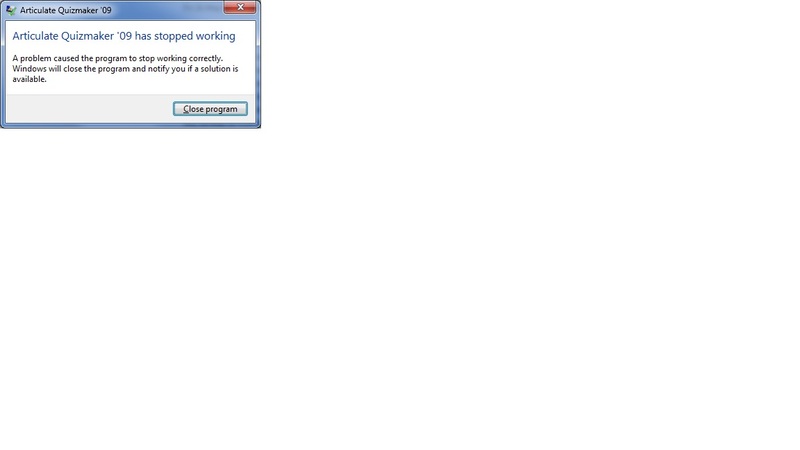 ; subsequently trying to use "edit in Quizmaker" results inthe same error though. I wonder if anyone has any ideas on what I should try next as I need to correct 1 of the original questions in the LMS published course that I developed previously and , as mentioned above, I cannot open the original *.quiz file to fix it. I forgot to mention that I tried that before I got round to trying the reinstall. I also tried this again just now - still Quizmaker refuses to run with the same error box popping up. and you've used on this PC before, with the 64-bit system? Yes, I installed the Artculate suite in mid January 2011 when I got the new laptop and have created 5 courses (with quizzes) using it. Would you mind running a Quizmaker log for us? 3. Launch Quizmaker and duplicate your issue. 5. Locate the log file and attach it to your reply for our review. 1. Open a window in Vista. 2. Select Organize - > Folder and Search Options. 4. Under "Hidden files and folders" select "Show hidden files and folders." 8. Attach it to your reply. 1. Open a window like My Documents. 2. To to Tools -> Folder Options. Did Quizmaker crash when you opened it while recording the log? What method did you use to open Quizmaker? Yes, it came up with the same error window and then closed. On this occasion I double clicked a *.quiz file to initiate it. Can you please submit a case to us so we can help you out? Can you please also include the URL for this thread in the Related Forums URL field?